Apple's government affairs chief has written a letter defending the company's practices on privacy and data collection, calling them "radically different" from the actions of other tech companies, like Facebook and Alphabet. 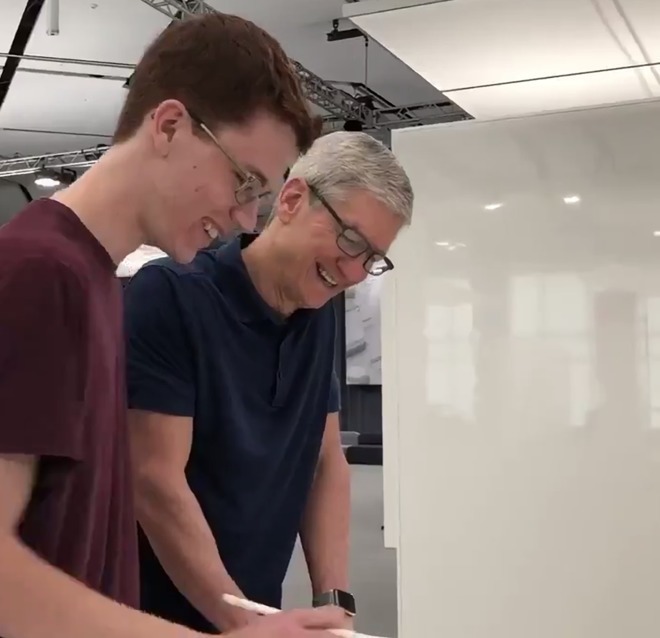 In a letter dated Tuesday, Timothy Powderly, Apple's director of federal government affairs, writes to Rep. Greg Walden (R-OR), chairman of the House Committee on Energy and Commerce, in response to questions Walden had posed to CEO Tim Cook in a July 9 letter. While the letter does not mention Facebook by name, it's fairly clear that that's who Apple is seeking to contrast themselves with. "We believe privacy is a fundamental human right and purposely design our products and services to minimize our collection of customer data," the August 7 letter from Powderly says. "When we do collect data, we're transparent about it and work to disassociate it from the user. We utilize on-device processing to minimize data collection by Apple. The customer is not our product, and our business model does not depend on collecting vast amounts of personally identifiable information to enrich targeted profiles marketed to advertising." The answers were consistent with what Tim Cook had said about Facebook and data in a series of recent interviews. The letter also includes answers to questions from the committee about how Apple's location services work, as well as their data collection policies, and whether Siri's microphone functionality can have any illicit uses. Powderly had already written a similar letter to Sen. Charles Grassley (R-IA), chairman of the Senate Judiciary Committee. Grassley's committee had held hearings in April on "Facebook, Social Media Privacy, and the Use and Abuse of Data." Those hearings, held at the height of the Cambridge Analytica brouhaha, included testimony by Facebook CEO Mark Zuckerberg. The letters, sent to Apple CEO Tim Cook and Alphabet CEO Larry Page, were written due to an increase in media reports. The reports, as well as other information provided to the lawmakers, have apparently raised questions about the privacy practices of both companies. The letter to Google's Page included references to reports claiming Android collects user location data and sends it back to Alphabet's Google, even if users disabled the device's location services beforehand. The letter to Cook reportedly raised fewer issues, but still queried if iPhones collect and transmit "extensive location data." Cook's previous statements and Apple's actions also "raise questions about how Apple device users' data is protected and when it is shared and compiled." Aside from location data, the letters also wanted to know about how devices collect audio data from user conversations, and sharing that data with third parties. The letters were signed by Chairman Greg Walden (R, OR) and subcommittee chairmen Gregg Harper (R, MS), Marsha Blackburn (R., TN), and Robert Latta (R., OH). The request follows in the wake of the Cambridge Analytica affair, where a now-defunct political consulting firm created approximately 71 million U.S. voter profiles based on data it had harvested from Facebook without user consent in 2015. Facebook accused Analytica of violating policies, while researchers who created the quiz app behind the affair claimed that, not only did they do nothing wrong, but they were not the only party to collect data in that way. A U.S. federal probe is underway, with the FBI, the Justice Department, the Federal Trade Commission, and the Securities and Exchange Commission said to be taking part in the investigation. In June, it was claimed by Facebook that it had data-sharing partnerships with a number of firms, including Apple, which granted third-party access to user data before the social network made apps available for mobile devices. In response, Cook told an audience at WWDC that Apple neither requested nor received users' personal data from Facebook. Lawmakers have questioned Apple's policies regarding privacy in the past, asking in 2017 about Apple's dealings with China over concerns it was complicit in assisting China's censorship-based regime. Answers from the company noted it adheres to laws in countries it does business within, and in relation to promoting freedom of expression and privacy rights, Apple's presence throughout the world is "the most effective way it can make a difference" in such countries.